For years I had a hard time figuring out how to simplify all the stuff in my life. Just when I thought I had one corner of my home organized or was able to streamline one area of life, babies or kids or teens or puppies came along, and then jobs or school or projects, or seasons or houses or other situations changed, and everything would fall apart all over again. Ahhh! It was such a crazy cycle of always trying to figure out if there was any possible way to get ahead of the chaos. Usually, though, I just felt buried under it all, which brought even more stress to the situation. I wanted my home to be my sanctuary, but so much “stuff” was in the way I wasn’t sure where to start. 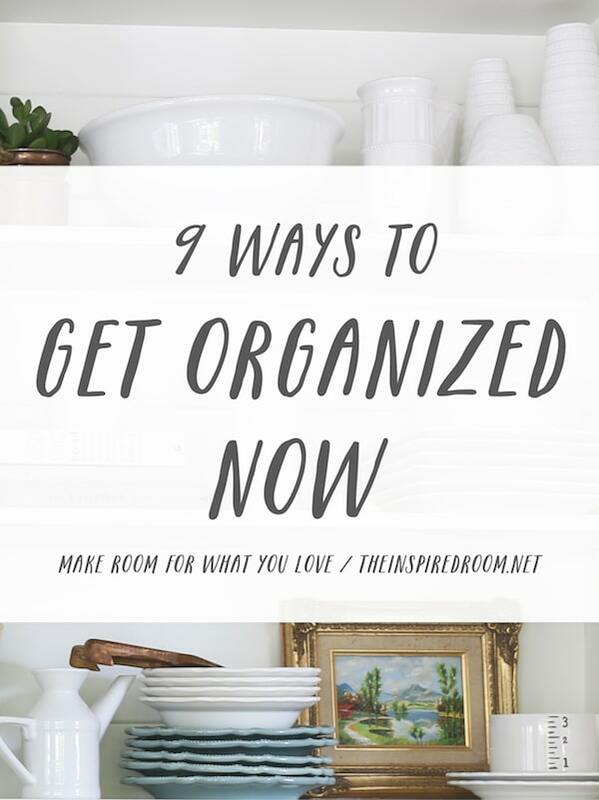 Trying to get organized actually made me feel even more frazzled because at times I was so overwhelmed and easily distracted that I’d sometimes pull everything out into the room and then end up just stuffing it all back where it was. It took me years to figure out where I was going wrong and what habits I needed to develop to change our home. I’ll be honest, I still have seasons where I experience disorder (moving chaos or kitchen remodeling, anyone?) but the difference now is that I know how to get myself back on the path to simplicity and order without stressing myself out too much. Seasons (and stress and clutter) will come and go, but the principles, skills and mindsets for a more orderly life we need can get us through all the ups and downs. 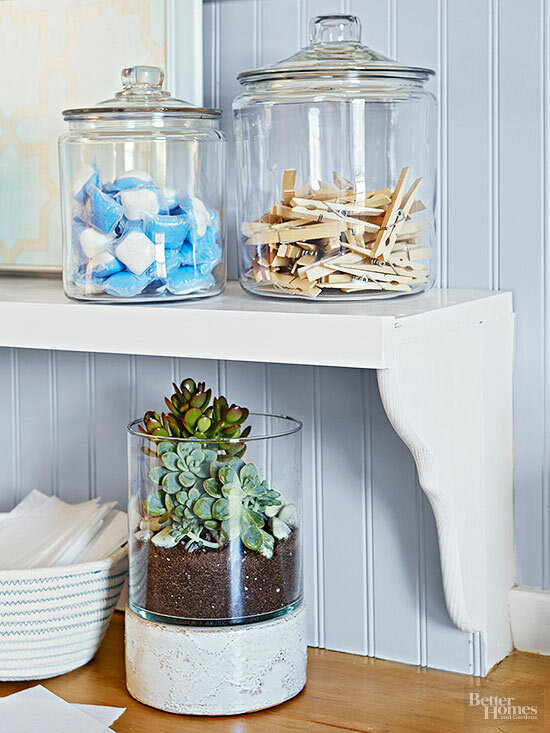 Here are 9 ways to get more organized, without getting more stressed! 1. Deal with one situation at a time. When we are stressed out or disorganized, it’s easy to add additional stress to the situation by trying to tackle every problem at once. Don’t do that. Pick one decluttering task you need to accomplish for your sanity and don’t start something else until you have the first one under control. If you are like me and can’t even decide where to begin because it all feels overwhelming, make a list of the potential tasks to tackle. Then decide which project would alleviate the most stress right away and start there. Or put the potential areas on slips of paper in a hat and choose one at random! 2. Zero in on essentials first. If you feel behind on every possible task and your entire house feels like a bomb went off every day, here’s something that has helped me to better focus. Divide the to-do list into two lists. On one, list of everything you feel like you need to do in a day or want to do to get better organized. That list is overwhelming, so don’t pull that one out everyday. On the other list, write down only the most essential daily tasks that you need to keep up on or deal with on an ordinary day (dishes, for instance). Make headway on the essentials list everyday and when you finally feel like you have those daily tasks under better control, let yourself move on to the extras (or enlist help to make progress on your secondary list!). Don’t add additional stress to your life by having unrealistic expectations. Getting organized can take time. On the other hand, it’s not always reasonable to think you have to stay in chaos because you are busy, have kids or have a job. You are more likely to dig your way out of clutter or chaos if you set some goals that will help you to feel motivated to stay on task and make noticeable but reasonable progress. It’s hard to have a super messy home when you don’t have an excessive amount of stuff. So rather than focusing on getting all the stuff organized, focus on getting rid of as much as you possibly can. You should keep only as much stuff as you have the capacity to maintain and enjoy on a regular basis. Anything more is too much and will add stress to your life. Do an experiment for a week. Stay off of social media, shut down your phone for period of time each day, or cut out an activity or current responsibility you don’t really need to do. See if you feel less stressed and have more time to get organized when you have more margins in your day. 6. Make more room for things you love. If your house is overstuffed and disorganized, it’s hard to get organized, let alone hard to even enjoy the things you really love. Create more space in your home for the things you love the most. What do you have that brings you the most happiness? 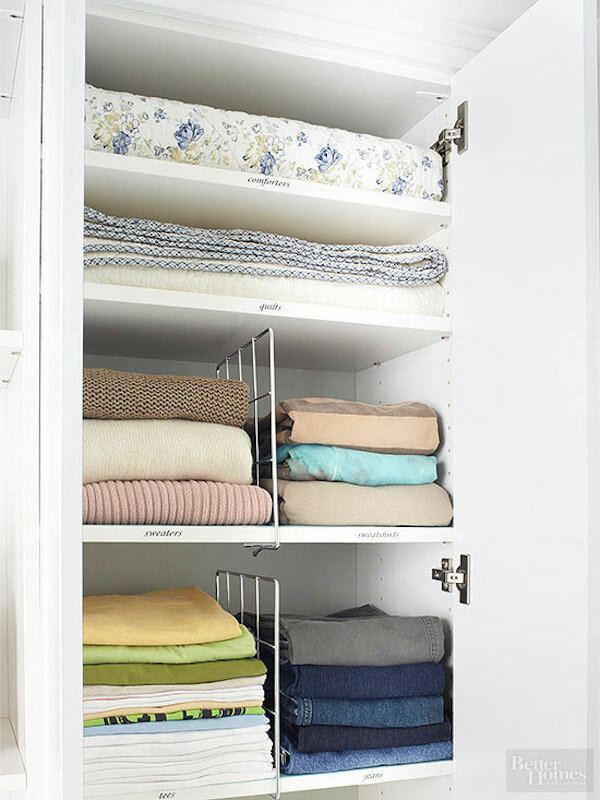 What is just taking up space in your closet or home? What could you let go of to create more breathing room around the things you enjoy? 7. Collect experiences, not stuff. Stuff can bring enjoyment, but it can also add more chaos and stress. Rather than finding delight in purchasing more items, enjoy the experience of creating more memories instead. One of the reasons we stay disorganized is that we overthink clutter. We can’t decide what to do with something, so we set it aside when we should have let it go. Clutter multiplies when we are indecisive. You might find yourself obsessing over the right way or best way to get organized, rather than just getting the task done. You might spend more time thinking about a task or even distracting yourself from doing a task than it would actually take to complete it. 9. Commit to long term success. 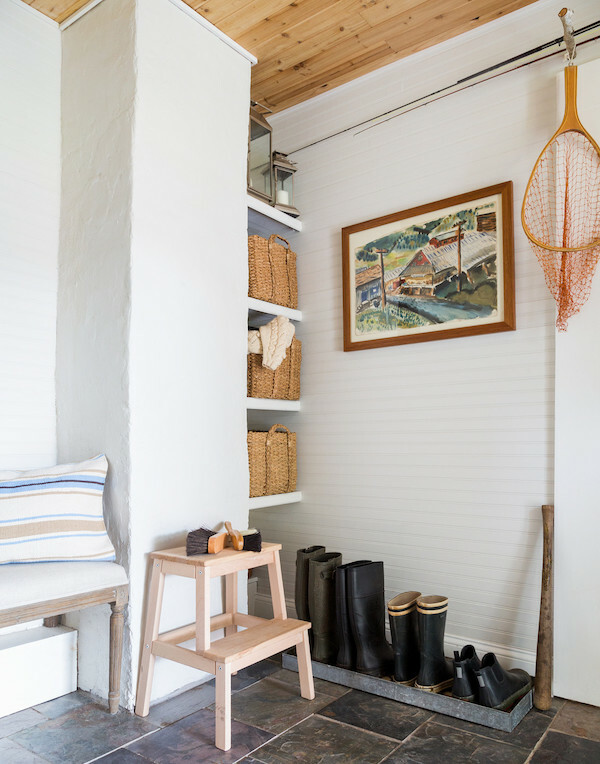 You might have hundreds of things you know you need to declutter and dozens of areas you’d like to organize around your home. Yet it helps to focus on a long term goal rather than just your overwhelming list of tasks to be done. Reminding yourself of your end goal can inspire you to keep on pressing forward with all the smaller tasks. 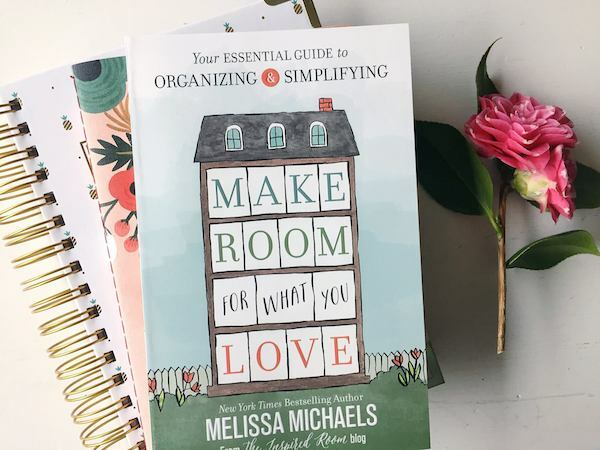 If you are ready to change your habits and transform your home for good, my book Make Room for What You Love is the book for you. You’ll find the encouragement you need and the practical application to make it happen! This isn’t your ordinary organizing book written by someone who was born organized. I understand what it’s like to feel overwhelmed and have solutions that will inspire you to make progress. You’ll come away a new perspective on your home, more efficient habits and the motivation to transform your home and your life. 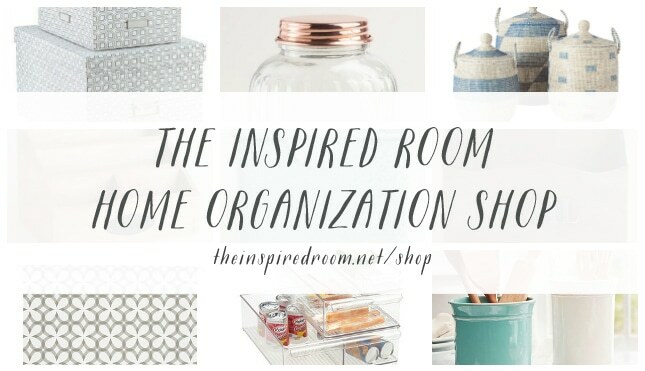 Click HERE or the banner below to visit my Home Organization Shop! What stresses you out the most about dealing with clutter? Just yesterday, after 4 years in this new home, a couple of garage sales and countless trips to Goodwill, I finally finished organizing my little hobby room. It’s been a challenge because I was unwilling to spend more money on more shelving. Silly…. It only cost a couple of hours and less than $100! I did such a good job that I spent 2 hours last night working on some Christmas ornaments I had started almost 2 years ago! I’m working on a whole house purge and downsizing. My biggest accomplishment to date was my wardrobe. I’ve gone thru every closet, cupboard, shelf and drawer and gotten rid of everything I didn’t wear, need or already had several just like. Five trips to consignment stores and two trips to a vintage store plus many bags went to my daughter in law to try on. I still have seven bags in the basement waiting for the rest of the family to claim them. Four huge bags are waiting for the next charity pick up. It was a lot of work both physically and emotionally letting go of clothes I liked but didn’t need. My goal for the rest of 2016 is to finish purging the top floor of our house. January, I move to the ground floor. And I’ll go room by room. It gives me such a lift to open a drawer and see just what I need, not what I crammed in. Clutter, be afraid. Be very afraid. Good for you. And I had to chuckle at your last line: clutter be afraid. Be very afraid. Ha! Love this list! Thank you so much for sharing. 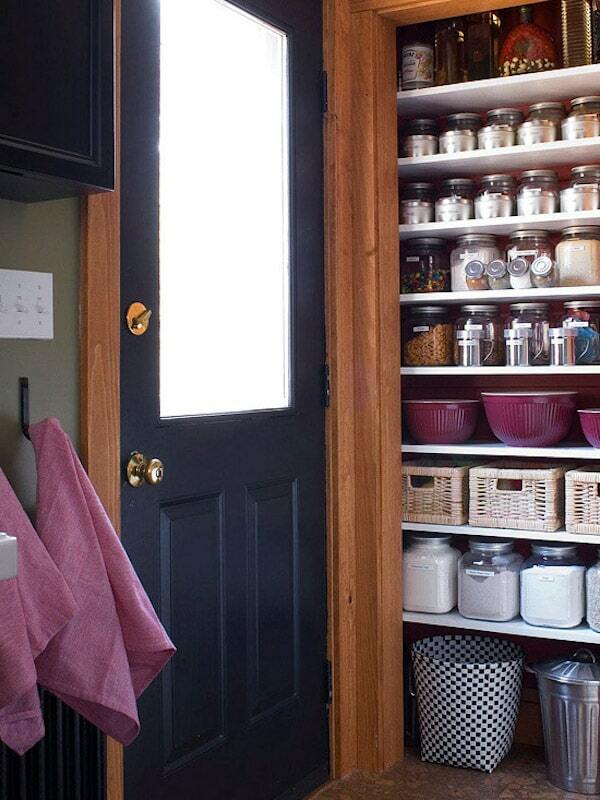 Getting organized can be a huge undertaking. I love these tips and really need them today. When we got married in mid-life and combined homes, we were busting at the seams! Slowly, we are getting things in order! This article was like someone looking directly into my life. I LOVE organization, but always leave big projects to “when I get caught up on laundry and life” which truly never quite happens. I get intimidated by the amount of things that need done, so find myself shutting down a little in the process. Thanks for sharing this…I love each days readings for the cool ideas, but this one really hit home! I have a clutter free home as keeping an organized home is one of my strengths. My husband has a harder time parting with items, even if he never, ever uses them and they’ve been in the back of a closet for years. Two strategies that work are: 1. Tell him you can sell it and make money. 2. Remind him someone out there NEEDS that coat, old camera, etc. and that it is sad it sits in that box or whatever when someone really needs it. When I took psychology in college there was a term for number 3. Now I can’t remember it – cluttered mind!! But it was something like over-optimistic expectation(s). You make that list of things to do ‘today’ and don’t get through half of them. Ease up on yourself! Make that ‘today’ list for the week and tackle the most important items first (number 2!). Or the biggest items – get them out of the way! You’re only human!! I began my interest in minimalism when it took me three weeks to clean out my dad’s place after he died. I don’t want someone to have to do that for my ‘junk’. So I’m trying hard to downsize and minimalize. Here’s another tip, something my lawyer told me (yes, my lawyer). I had come into his office with a codicil to my will – a three-page list of things I wanted to go to certain people. He said, ‘Just give the stuff to them. What are you waiting for?’ Hunh. I never thought of that. So I did. Now at least THAT part of what I want is done. Family heirlooms especially. Of course I just thought of the psychological term I couldn’t come up with when I was making my reply before and it’s PLANNING FALLACY. I like ‘over-optimistic expectations’, however, it seems so much nicer. HA! Oops, I meant BOTH of your books Love the Home you Have and Make Room For What You Love! Both were wonderful game changers for us! #8 !! Which is why I’m on your page now. I search & research how to get rid of all of our clutter because I just don’t want to do it!!! It is so overwhelming and I don’t even want to start in one little area! I honestly just want to move and leave all this crap behind! My house is not hoarded but over the years from having two children we’ve acquired so many toys and things but it just seems like it’s everywhere. If I work on the clutter then I don’t seem to get the dishes and the laundry and the daily stuff done. It’s just very stressful and time-consuming. One of these days I will become a minimalist and have next to nothing in the home and then enjoy what really matters… which is life itself!